Celebrate your four-day bank holiday weekend at Bewl Water this Easter! From Good Friday to Easter Monday we have a great selection of offers, for you and your whole family to enjoy. Good Friday - You can enjoy a delicious Fish & Chip lunch in our Boat House Bistro, whist overlooking the stunning Bewl Water Reservoir. Saturday 21st April & Easter Monday - Enjoy a 2 or 3 course set menu, dishes include ragout of spring lamb shoulder, Thai style potato cakes and sirloin steak. 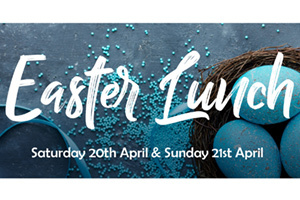 Easter Sunday - Our Easter menu is filled with the finest spring flavours so get the family together and enjoy a hearty 2 or 3-course Sunday roast.